Also called the Zen in early fanfics and websites, The Zon is Lawndale's alterna-rock/grunge venue/bar where Mystik Spiral had regular gigs. Found on Dega Street, it is considered a hangout for the young adult demographic. High-school students are sometimes found there. 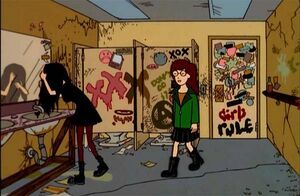 Jane Lane and Daria Morgendorffer attend only to provide support (moral and roadie) for the band Mystik Spiral, of which Jane's older brother, Trent Lane, is the lead singer and lead guitarist. Tom Sloane went at least once for the sheer fun of it. The club is incredibly filthy, especially the toilets. Despite much of the clientele being underage, it appears to serve alcohol. The Zon first appeared in the opening scenes from "Ill". It resurfaced in "Pierce Me" where Trent debuted his song for Jane's birthday; and in "Jane's Addition", Jane meets Tom at the Zon while Mystik Spiral is playing live music. It is also part of the Dega Street level of the Daria's Inferno game. The source of the confusion over the place's proper name is unclear (possibly due to a murky image from an episode in the series), but the Virtual Lawndale webpage in MTV's Daria website and Daria's Inferno show the name as "The Zon" (look for location #10 on the map). In Daria's Inferno, Daria pronounces the name as "Zōn" (like "Zone"). The Zon frequently appears in fanfiction, far more often than its canon appearances, as it's the only proper hangout and venue for Mystik Spiral we were shown in Lawndale. This page was last edited on 5 July 2018, at 00:37.